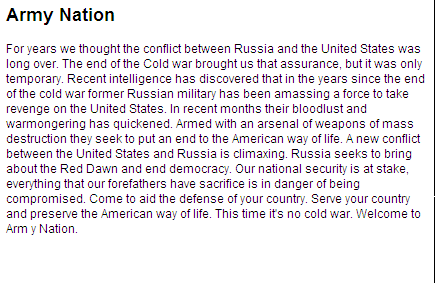 A new conflict between the United States and Russia is climaxing. Russia seeks to bring about the Red Dawn and end democracy. Our national security is at stake, everything that our forefathers have sacrifice is in danger of being compromised. Come to aid the defense of your country. Serve your country and preserve the American way of life. This time it's no cold war. Welcome to Army Nation.